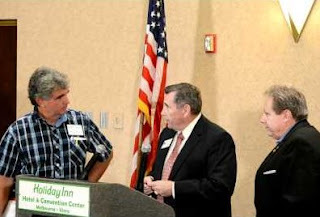 BREVARD COUNTY, Florida -- The Brevard County Republican Executive Committee hosted the first debate between current Brevard County Clerk of Court Mitch Needelman and former Brevard County Clerk of Court Scott Ellis at the Holiday Inn in Viera. The hour-long debate was heated at times, where Needelman called Ellis a liar and that Ellis' numbers were in "Fantasyland" while Ellis characterized the environment at the Clerk's office as "evil." The major issue between the two is whether Ellis left the Clerk's office in the black prior to Needelman taking over. Ellis contended that there wasn't any crisis to justify the extreme changes made to the Clerk's office such as firing and rehiring Clerk employees through a private company. Needelman said that it wasn't outsourcing, but staff sourcing of Clerk employees which was put out to a competitive bid along with health insurance. According to Needelman, there were three bids for the staff sourcing, and five bids for the health insurance. The video of the debate can be seen HERE.